Figure 1. Precursor-product exchange systems in lactic acid bacteria. Three examples are shown. 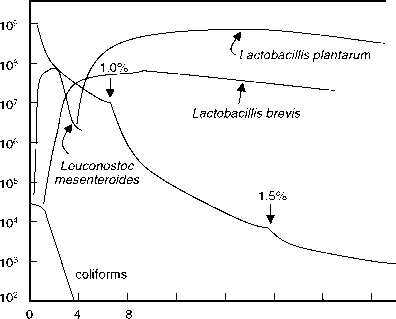 In Streptococcus thermophilus (and some strains of Lactobacillus), lactose is transported by the LacS system via proton-symport (panel A). Intracellular hydrolysis releases free galactose, which is not metabolized, but is instead secreted. The efflux reaction, which appears to be favored in most strains, then drives uptake of lactose. Citrate-fermenting lactic acid bacteria transport citrate via the CitP citrate permease (panel B). Metabolism of citrate, or glucose when it is also available, generates lactic acid, whose efflux through CitP can drive citrate uptake. This reaction is electrogenic, in that a proton is consumed within the cytoplasm, increasing the proton motive force across the membrane. Lactic acid bacteria capable of metabolizing the amino acid arginine do so via the arginine deiminase pathway (panel C). The products of this pathway are NH3, CO2, ornithine, and ATP. Ornithine can be effluxed via the arginine transporter (ArcD), in exchange for arginine. The cell, therefore, gains energy from arginine (one mole of ATP per arginine metabolized), without having to spend transport energy.